I have been spinning on the singles that I will cable, so I thought I'd show them to you. This is 70% Merino/30% Kid Mohair and I'm spinning them in a laceweight. I'm going to spin four bobbins of singles, then ply them together in twos, then reply onto my giant plying bobbin - I think. This top is very soft and its almost pure white, but I feel like I'm not quite getting a rhythm with it. I seem to either be treadling too slow or drafting too fast. I've got the whorl set at the highest ratio, but I guess as slippery as the fiber is, I just haven't figured out exactly how to get this spun. Because I feel like I'm not quite getting it (its getting spun, I'm just not relaxing while I spin it, which pretty much defeats the purpose of spinning), this is the first bobbin. At this rate, if I don't get the hang of this soon, I'll be spinning this until Christmas. I've also discovered that I spin more fiber, faster when its colored. 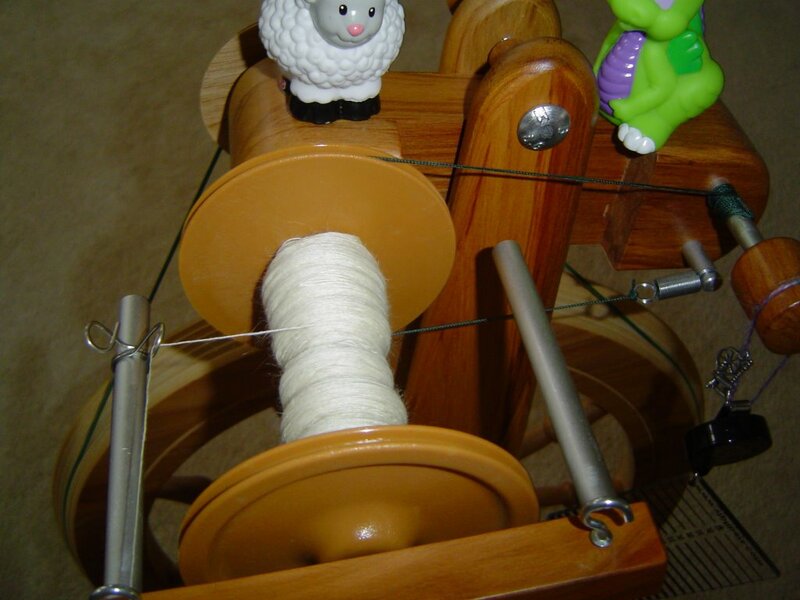 I love the natural whites and creams that grow on the sheep and other fiber critters, but spinning colored top or roving seems to keep my attention better. 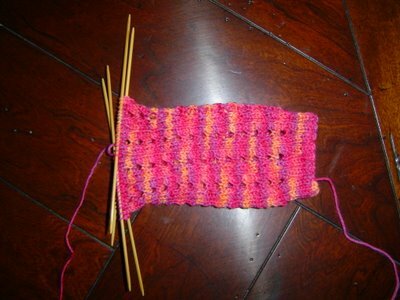 I guess its like knitting with variegated or tweed yarns - you keep going because you don't know where the colors will land next. On a completely non spinning note, I have a question. A couple of years ago I made some felted slippers from Brown Sheep Lamb's Pride Worsted (they aren't the Felted Clogs, but they are a Fiber Trends pattern). They wore out at the end of that Winter. Since just about everyone who has ever picked up a pair of knitting needles has knit these (if you haven't you really should - they also make great gifts for men - Mickael lives in his), what are your favorite yarns to use for them? What seems to last the longest? I pulled out my green handspun again and I'm much happier with the socks this time. The first time I started knitting with this yarn, I used the Harris Tweed stitch pattern and needles that were slightly too small for the yarn. This time, I'm using a simple pattern of purl bumps, regularly spaced over the sock and I went up 0.25mm in needle size - its amazing how much better the sock feels in the slightly larger needle. (I think I'm using US 3's on these, but I can't remember and the sock is upstairs.) These socks will be thick and cozy, probably to be worn as slipper socks. I'm making the legs fairly tall and they are wider than I normally make socks, so they should be slouchy and comfortable. I'm ready for the Fall to come, tired of the heat and humidity. Everything looks tired, the trees, the grass, even the sky. Its kind of a faded blue lately, like its too much trouble in the heat to get to a definite blue color. I love the sky in Autumn. I love the way the blue is bright and strong, the air starts to feel cool, the leaves turn all the wonderful colors of the season, and its wonderful to be outside. I know that's coming soon and as a knitter, I'm thinking of wool: pullovers, cardigans, socks, wraps. All of the soft, snuggly things that smell vaguely of sheep that we get to wrap around ourselves as the weather gets colder and the days get shorter. I finished the socks I have been working on. 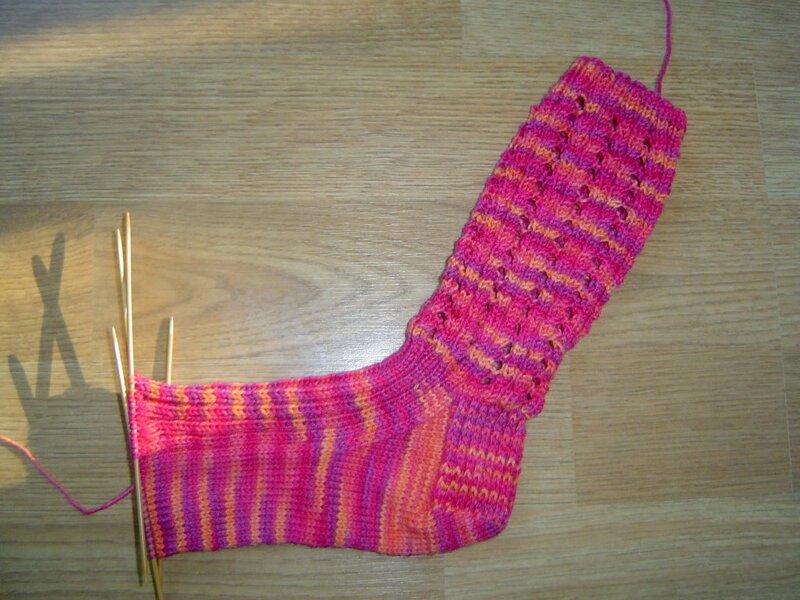 It feels like forever since I finished a pair of socks - I actually had to think a minute before I could Kitchener the toe on the last sock! These are knit on US 0's in Lorna's Laces Shepard Sock in the Bittersweet colorway. I made up the pattern and I hope to get it written up at some point. When I do, I will post it on the Pink Lemon Knits group. If you don't know what Pink Lemon Knits is, its my Yahoo group that I use to announce happenings with new patterns and knit alongs. The Hot Rod Socks pattern is available there now, and I plan to periodically add other free patterns to the Files section. If you want to join, click HERE. 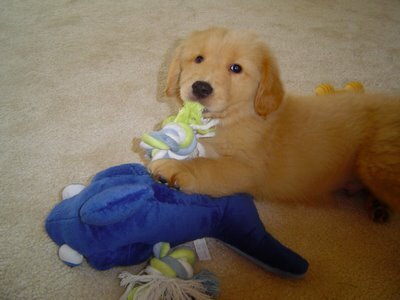 OK, enough of the socks, everyone is really here for the puppy pics! Finn is doing great! He set a new personal record yesterday - two days in a row without an accident in the house! WOoHOo! He was alternating days there for a while: one day of going outside to do his business, and one day for me to work on my carpet cleaning techniques. So far today he's doing great and considering that most of his accidents have been in the morning (before I'm caffeinated), that's a good thing. Finn has discovered the air conditioning vents and let me tell you, he loves them. He uses them to cool off after he's been outside on his little walks (smart dog), but he also likes to sleep on them even when he's not hot from outside. He turns into a little pupsicle, and to be honest I don't know how he can stand it! 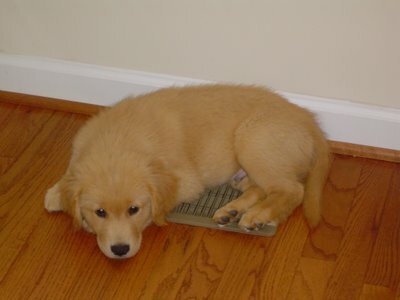 He's not going to be too thrilled in a few months when heat starts coming out those vents. The picture above is pretty accurate colorwise. When he gets his picture taken with flash, he comes out darker and more red than he really is. 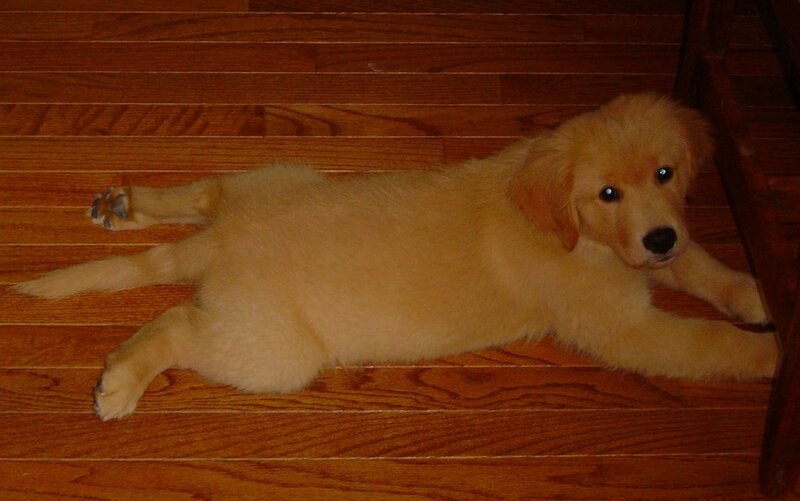 Here's one more shot of the little guy, doing Frog Dog! This weekend I piddled around with the silk caps some more. I've actually finished spinning the first set of caps (this is less than half an ounce). You can kind of see the texture you get from spinning silk caps - I love all the bumps and chunks in this yarn. The Silkworker has silk caps available on her website again (this is where I got my silk caps). The spindle I'm using is my Emily - it's rosewood and weighs 1.2 ounces and has a fabulous spin time and speed. This spindle is probably tied with my Bossies as my favorite spindles. For some reason I don't hear as much about the Emilys, but I feel like they are an excellent spindle and are a bit cheaper than the Bossies, which is always nice. I have no idea what I'll do with the silk yarn once its all spun, but hopefully it will speak to me. ...here is the second sock for this pair. Yep, I'm just starting the gusset now and at the rate I'm going, I should finish the sock by Halloween or so. Actually, I only picked up the sock again a couple of days ago, so its not quite that bad. We all seem to be getting into a rhythm with Finn now and I'm hoping that I'll have more time to knit soon. Yesterday I actually got about 12 rows done on my Mystery Shawl (yes, I designed it and I still don't have it done yet). I also started spinning something else - Merino and Kid Mohair. 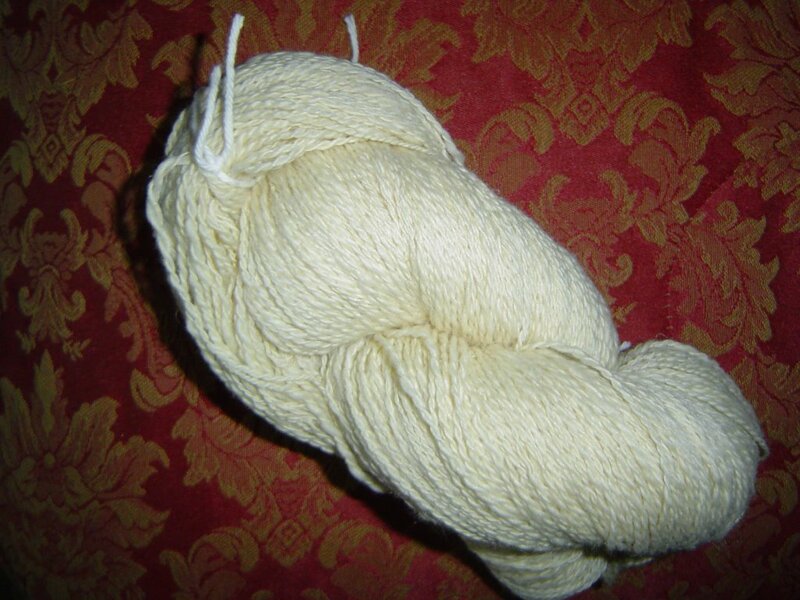 Its pure white and I'm going to make a cabled yarn* with it. I've never done a cabled yarn before but I think it will make the yarn strong - of course I'm planning some socks with it. While I'm spinning it, Edelweiss, from the Sound of Music keeps running through my head. I did notice that there is a pair of socks by that name in the new Fall Vogue Knitting. By the way, is it just me or is the Fall VK the BEST VK they've done in a long time? I've been feeling kind of lukewarm about VK lately and have been thinking of not renewing my subscription, but WOW, if they keep going the way they did this issue, I'll keep subscribing. They had a really great mix of high fashion things, things that are really wearable, and socks! If you don't subscribe, take a look at it, I think you'll be surprised, although honestly, I'm not caffeinated yet and I just noticed that this entire entry, while pretty much fiber related, wanders all over the place in topic and its one giant paragraph! I think I'll leave it that way. HA HA. Have a great weekend. *For anyone who doesn't know what cabled yarn is: Cabled yarn is made by spinning the singles, then plying them together the opposite direction from the way they were spun (at this point you have a standard 2 ply yarn), but you over ply a little bit. Then, you go back and twist the 2 ply in the original spinning direction. You have a yarn made up of 4 plies, but its not a standard 4 ply yarn. I think its referred to as a 2 ply cabled yarn. I'll get some good pictures to explain all this as I spin. 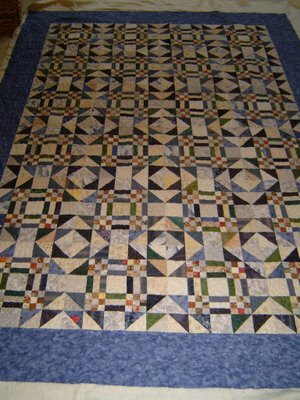 Remember this quilt top I showed you a while back? I got it back from the quilters! I've got to trim it up and bind it, then Caleb can sleep under it this Fall. I made the top ages ago, I just never put borders on it or quilted it. The block pattern is Goose in the Pond. (The block directions in the previous link make a 10 inch finished block which is smaller than the block size I used, but it will give you a better idea of what the block looks like.) 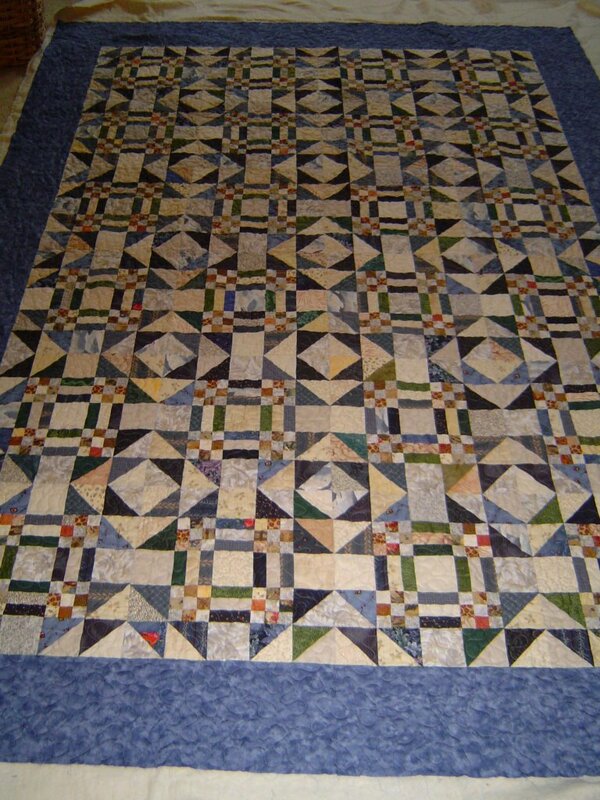 Its a scrappy top, I used different whites and pale beiges for the background, blues and greens for the "Geese" (half square triangles) and the stripes, and darker beiges and browns for the nine patches. Caleb is already having fun looking at the different fabrics in this quilt. There are dolphins, leaves, flowers, birds, hearts, and cowboys in the various prints. Here is a close up of one corner so you can see the quilting. I asked for an allover pattern called a stipple, which is essentially a meandering line that never crosses itself. They did a beautiful job on it. 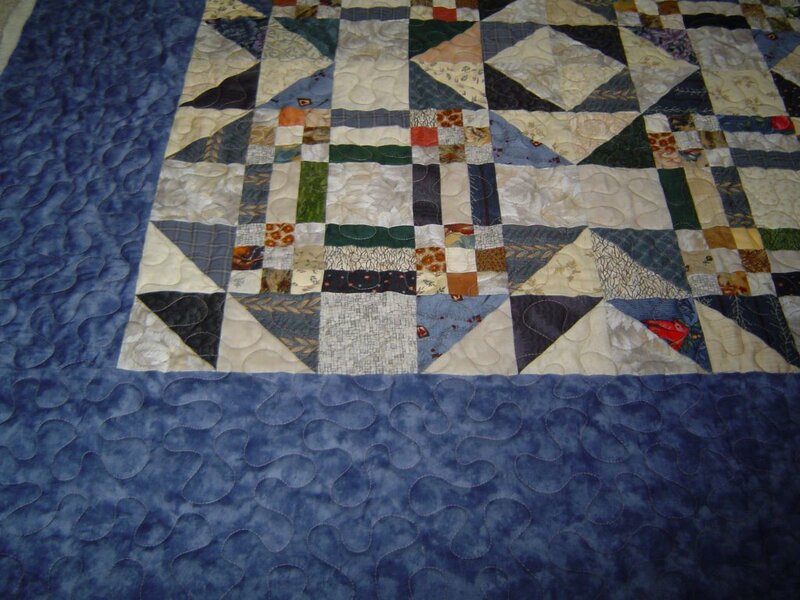 I have a number of quilts in various stages of being finished and I really need to get working on them. The Sew? I Knit along project for this month and next month is a quilt. Maybe I can get out another one and get it finished. 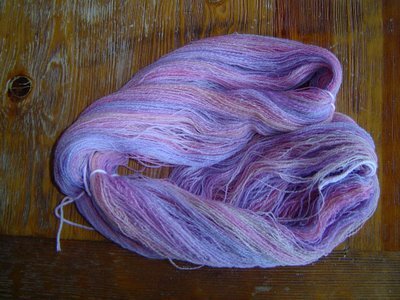 I finished spinning the Iris Merino and Silk and got it all plied and washed yesterday. I ended up with 590 yards, which should be plenty for the Flower Basket Shawl (I said Flower Garden, I meant Flower Basket - I blog in an uncaffeinated state - you guys should appreciate that I even use full sentences). The color in yesterday's post is truer to the actual yarn, for some reason it looks more blue in today's photo than it really is. I've wanted to do the Flower Basket Shawl for a while now (actually ever since it was published - IK Fall 2004) but I haven't had the perfect yarn and I wasn't sure what color to use. This yarn just seems perfect for it. It should knit up as V shaped stripes, but since the colors are soft and blend together and the lace pattern is simple and repetitive, I think it will be a good combination. This is my other spinning project that I worked on last week. Its Merino and Silk in the Iris Colorway from Kendig Cottage. Its so much fun watching the colors change as I spin it and even though I only have 2 ounces of it, I'm hoping for some pretty great yardage on it because I'm spinning the singles in a very fine laceweight. I think this might have to be a Flower Garden Shawl, unless it tells me otherwise. Thanks for all the comments on the cowl idea. I haven't decided quite what pattern I'll use (I won't be making Batman's cowl though - thanks Rick). 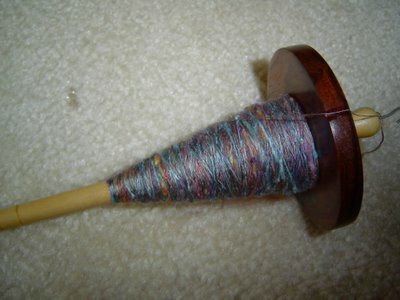 Someone asked how the Merino and Hemp was to spin, so I'll tell you. It was wonderful. 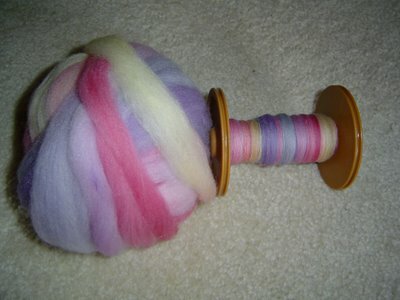 I didn't find it much different from spinning Merino, but I had trouble with Merino when I first started spinning too. I either couldn't draft it or it just slipped out of my hands too fast. At the time, I wasn't regularly predrafting unless the roving or top looked compressed. Now that I predraft everything (yes, everything) I haven't had problems spinning anything. I haven't spun every fiber out there by any means, but the ones I've played with have all been pretty easy once I predraft the fiber. I've discovered that while knitting with a puppy is difficult, they have no concept of waiting until you finish a row, spinning is great. I can stop the wheel and jump up to get Finn as soon as he starts sniffing suspiciously. So last week, I got more spinning done than I have in a long time. This is the Merino and Hemp I picked up from D'Zined at Maryland, all plied and finished. I got 519 yards from the 8 ounces, probably either a sport or DK weight. I'm not sure what I want to do with it yet. Its very soft and quite drapey so I'm kind of thinking about a cowl type of thing. I haven't decided if I want a Mobius one or just a simple tube. What do you guys think? Any other ideas or other cowl patterns you love? I'd like to introduce the new blog dog, Finn! Finn is an Irish name that means "Little Blond Warrior" which totally cracked us up. We picked him up Tuesday. He's 9 weeks old and weighs 11 pounds, 12 ounces. He is a sweetheart and has really settled in to our home and family very quickly. He didn't even whimper his first night the way many pups do - he just went right to sleep. He seems to be pretty smart and is catching on to things pretty fast. We're having a blast getting to know him and Caleb is learning how to play with him. Ramius isn't too thrilled about him but he seems to be relaxing a little bit. Last night after dinner, he fell asleep like this. I'm guessing he feels pretty comfortable with us! Thanks for all the comments yesterday. I love hearing from everyone. One thing I've always found with knitting, is that its great for letting out nervous energy. 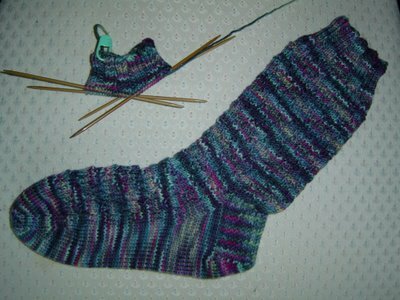 I'm almost finished with the first sock of this pair now. I'll finish it today and cast on the second one tonight. I decided to work the foot of the sock with a K2, P2 rib in the instep since the lace rib pattern didn't look too comfortable for the foot part. I'm going to take a bit of a blogging vacation next week. We'll be getting the new puppy so I can't imagine that I'll get much knitting or spinning done while we're getting him settled in. I'll probably post a time or two next week - and those posts will probably involve puppy pictures, but posting will be sporadic at best until the following week. I will be checking emails so I can keep up with those of you in MS2 who need help or have questions.I hope everyone has a great and safe weekend! I woke up early this morning, not to a glorious sunrise, but to news reports that the terrorists are trying to attack us again. After watching the news for a bit, I attempted to get a little more sleep - to no avail - and that's when I heard it. Coming from the bedroom down the hall, Caleb, my son, my angel, is laughing in his sleep. So, on behalf of a mother, I have a few things to say. Thank you to the Military, both the US and our Allies, who are fighting evil where it lives, often using innocent lives as sheilds. Thank you to the Intellegence Agents, who put together bits and pieces of conversations, current events and the minutiae of everyday life in an attempt to stay one step ahead of the plots these terrorists conceive. Thank you to the Law Enforcement Agents, who respond to every report of suspicious activity, even when we are just being paranoid. I know I don't say "Thank You" enough, but if you weren't there, standing between us and the evil which is trying with every fiber of its being to obliterate us, my son would not be sleeping safely in his bed, giggling while he sleeps. Thank you. I changed a few things. I was working on the green sock from yesterday's post and about halfway through the heel flap I realized I hadn't centered the design the right way. I was planning on doing the foot in K2, P2 rib instead of the Harris Tweed pattern and I hadn't put the heel in the right place to do this. 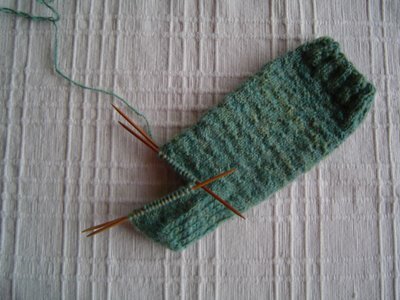 I could have just frogged the heel flap, but I decided I would just start over with needles a bit larger - the sock was pretty tight also. So, off to the frog pond it went. I didn't feel like restarting it immediately, so I pulled out some new sock yarn and started a completely different pair. This is Lorna's Laces in Bittersweet on size 0's. The pattern is an eyelet rib that's my own variation of something I found in a stitch dictionary. The yarn weight and colors are much more appropriate to the current weather than the green handspun. I think in a few weeks when the season starts to change, I'll get back on the green socks. Its a good thing I've got a large sock yarn stash! I started a new pair of socks with my handspun wool/mohair from MDS&W. I'm using the Harris Tweed stitch pattern and its looking strangely like horizontal pleats. For some reason this sock reminds me of an accordian. 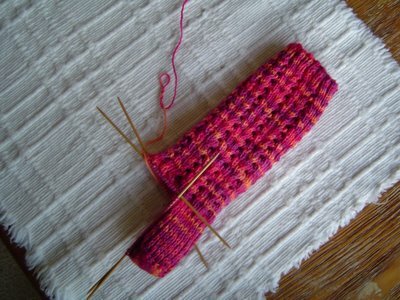 When I was working on the sock, I got to thinking about strange things that knitting does and how I don't know why it does these things. When I knit my first top down sock, I couldn't fathom how it was possible to get a shaped heel when I was reading the directions. I still think its a magical moment when you turn a right angle in a tube that's knitted around and around. Lace? Lace can stay straight if the decreases are right next to the YO's but if you move them a bit away, you get curves or points in your lace - all from knitting back and forth. 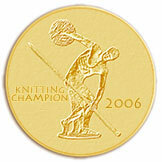 I don't really want to know exactly how knitting does these things. Its like finding out how a magician does a trick - you never really look at the trick in the same way. I guess its enough to know that these things can happen and I just enjoy it when they do. I finished my very first pair of Socks that Rock! This is the Socks that Rock, Medium weight in Chapman Springs. 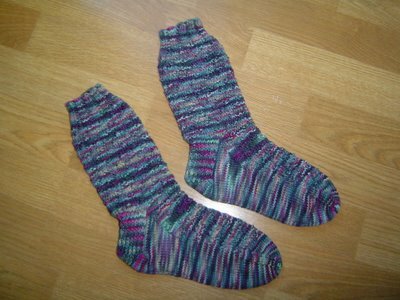 I knit them on size US 1.5's in the Stansfield #11 pattern from Sensational Knitted Socks. These were a fun pair of socks to knit and I love the yarn. I have one more skein of Socks that Rock in this same weight, but I will have to try out the light weight and the heavy weight soon. I can't get pictures to load today, but if I could you would see the second Chapman Springs Socks That Rock sock here worked halfway through the gusset. Its moving along nicely and I hope to finish it today. Those of you who mentioned Sock Wars, I appreciate it, but I feel like in order to really fight that battle I'd have to devote all of my primary knitting time to it. I have some ideas for some patterns I'd rather get designed and written up this Fall and then I can just knit socks when I need a break from my other knitting. I have a problem and I'm hoping you guys can help me. I'm looking for a new coat and I have a general idea of what I want but I can't find it. I'm hoping someone out there will know something. The coat I want is a wool or wool blend (no acrylic - I'm allergic), its black or possibly dark grey, its a jacket length - I want it shorter than a car coat or a 3/4 length coat, it needs a bit of shaping, and it has to come in a size Small. I've found a couple of "almosts" but either they didn't come in my size in black or it has real fur trim. I'm not opposed to fake fur, but I don't feel comfortable with real fur. Anyone know where to try? Post links and/or store names in the comments. Thanks! 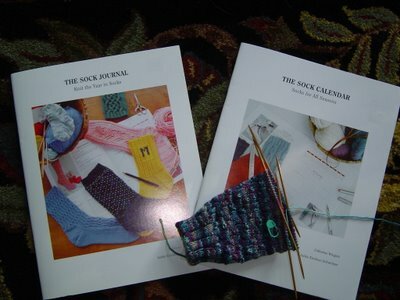 I picked up a couple more sock books yesterday. I've been hearing about these books since last year, but wanted to see them in person before I bought them. When I saw them, I knew I had to have them - there are some really great sock patterns in these! Also, I've been working on my second sock in the Socks That Rock. Its moving along quickly. I also worked on my Mystery Stole yesterday and got a nice amount done on it, but since I've knitted Clues 5 and 6 and those Clues aren't released yet, I can't show pictures of it here. 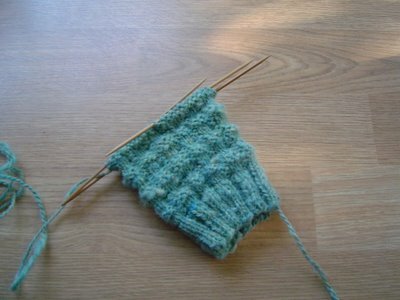 This weekend, I knit my first ever sock from Socks That Rock Yarn. I now totally understand why there's such a big fuss over this yarn. This is Chapman Springs in the medium weight that I got from The Fold at MDS&W (purchased just 30 minutes before they sold out of all the STR). I used Stansfield #11 from Sensational Knitted Socks as my stitch pattern. This yarn is so soft and bouncy, I know I will love wearing these socks. I'd like to try the lightweight version of STR as well, just to have an idea of how that knits up. I'm knitting the second half of my Mystery Stole so I think I will be working on socks as blog fodder until that's finished. I do hope to get it finished soon, because there are so many other things I want to be working on!